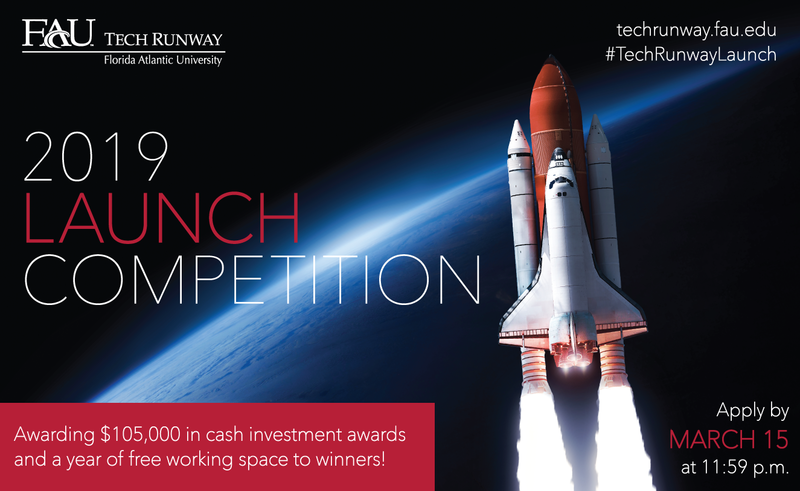 FAU Tech Runway is a core entrepreneurship hub that incubates and accelerates early-stage and startup companies. The annual Launch Competition provides the most promising ventures and talented entrepreneurs the opportunity to join the Venture Program. A class of 21 venture companies is selected once per year. Companies may apply to one of three separate tracks: community-based entrepreneurs, FAU undergraduate students, and FAU faculty, staff and graduate students. We seek exceptional entrepreneurs and startups with high-growth potential and disruptive technology. Winners frequently (though not exclusively) come from the following research areas: neuroscience, marine science and ocean engineering, environmental science, healthy aging, sensing and smart systems, cyber-security, big data analytics, artificial intelligence, machine learning, educational technologies and drone technologies. To view a full list of our Venture Class graduates, click here. To view Launch Competition resources, prizes, benefits, rules and eligibility requirements, click here. Launch your startup or expand your existing business into new verticals. Prime your venture company for product launch and investment. Understand the value of a minimal viable product and validate market fit. Contribute to the local economy by launching a South Florida based startup. Finalists will be notified by mid-April. Program runs 12 months in total. Intensive entrepreneurs bootcamp covering business fundamentals. C-Suite level mentoring, business development planning, implementation and founders' audits. Graduates benefit from on-going resources including guidance, marketing and affiliation with an elite network. Cash prize of $15,000 awarded to top seven ranked winners. Participants will be matched with elite, C-suite level mentors who have been trained in MIT's Venture Mentoring Service. Free working space for one year at FAU Tech Runway. Introduction to sources of venture financing. Access to FAU student interns. Preferred access to entrepreneurship-related events. Access to a network of seasoned entrepreneurs, world-class mentors, investors, instructors and technology experts.